Posted in Bright Ideas / Blog on November 13, 2018. As part of the Local Marketing Institute‘s Local Business Marketing Summit earlier this year, I had the pleasure of sharing my tips for developing an effective reputation management strategy. Take a look at the video below for the whole recording, or read on for a summary. I love what reputation can do for a business. When used correctly it can be a huge aid to driving more visibility and customers to your business. A powerful online reputation is a great form of social proof, and can inform potential consumers as well as business partners and suppliers. This presentation has two parts to it: first I’ll demonstrate the impact of reviews, then I’ll go into best practices for managing reviews. What’s stopping you doing more to manage your reputation? 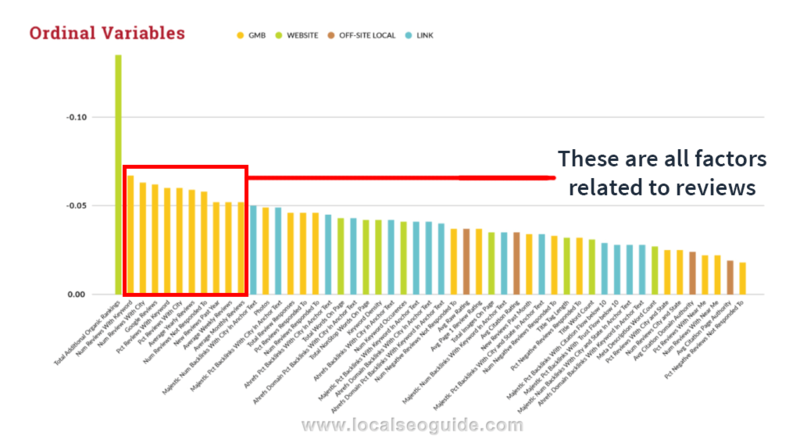 The Local SEO Ranking Factors Study shows that a large proportion of the most critical local rankings factors are tied to reviews. What this tells us is that the businesses that are ranking highest in Google local have good reviews and ratings in Google. A study performed by BrightLocal in 2016 shows that positive reviews increase CTR by 22%. The BrightLocal Landing Page Performance Study shows that reviews increase trust by 11% and that positive ratings increase the likelihood of a consumer contacting a business by 12%. You can also now read the latest report, released in December 2018. Firstly, run a good business! If you run a business that doesn’t care about its customers, you can’t paper over the cracks and try to build a good reputation. Here’s an effective review strategy that can work for both single-location and multi-location businesses. How many reviews you should aim for depends on your business type and how competitive your industry and location are, but ultimately you need enough reviews to convince a consumer to trust you. Put yourself in their shoes. If you saw a business with just three reviews, would you trust it? You also need enough reviews to convince Google to trust you. You should get enough reviews so you stand parallel to or above your competitors. Read our recent Google Reviews Study for help benchmarking your business against competitors in your industry. Look at your local competitors in Google, and see what reviews and ratings they’ve got. Use these to set your targets. You can use BrightLocal’s Local Search Results Checker to see local rankings. The more reviews you have, the greater the social proof, so you can never have too many reviews. But given that you’ll be balancing the time and investment with the return on those reviews, it’s worth bearing in mind two things. Firstly, the law of diminishing returns applies here, where going from 0 to 50 reviews will be hugely beneficial, but the next 50 won’t have quite as much impact. But on the flipside, review ‘freshness’ is important. The 2017 Local Consumer Review Survey shows that 77% of consumers think that reviews left longer than three months ago are not relevant (this grew to 85% in 2018). So when you think about your targets, remember that you need monthly, incremental changes. This helps to build reviews over time. You can steamroller competitors with a strategy that actually delivers. Ask customers to review you. Remember that 93% of consumers read online reviews for local businesses, so they’ll likely already be aware of your reviews. It’s not going to be an alien concept for them. According to our research, 69% of consumers will leave a review if asked to. That means if you ask ten people to review you, seven should do it. Make asking for reviews part of the service process. Remember that timing is key, too. You should ask when customer satisfaction is at its highest. Don’t leave it a month to ask for a review, as they’ll have cooled off and either leave a less positive review or be a lot less likely to review your business. Asking for a review at the point of service effectively nets you a verbal commitment. You can then follow up with an email or SMS message. You can do this part easily with BrightLocal’s new Reputation Manager tool. Using too many review sites will dilute reviews, so for the average local business, three or four sites should do it. To start with, focus on Google and Facebook, then look for other suitable review sites. Do a Google search for keywords related to your business and see which review sites are appearing high in search. These are the sites Google thinks are particularly relevant to the work you do, and will be getting a fair amount of traffic. Also look at the ‘Reviews from the web’ section of the Google Knowledge Panel for competitors and businesses like yours. Where these reviews come from may inspire you to add more sites to your list. There are lots of highly relevant, niche review sites for different industries (dentists, doctors, lawyers, for example). These niche sites are likely to be frequented by those at the end of their research phase, people you definitely want to get your reviews in front of. They also have the benefit of allowing a far higher level of detail in your listing. BrightLocal has a list of 300+ Niche Review Sites, separated by industry, that you can use to help you decide which sites to focus on. This is the part that businesses tend to fail in. It’s not good enough to just tell your staff to get more reviews. You need to help your staff understand the significance of reviews, and how social proof can help you win new customers. You can put it in terms they can relate to. For example, more customers equals more revenue, stronger business, and better job security. One way to highlight this is by using reviews to increase job satisfaction. At BrightLocal, we share our great reviews with everyone in the business via a Slack channel, and it reminds them how appreciated their work is. It brings everyone together and even helps with employee retention. For individual staff members, you can make generating reviews worth their while, in a monetary sense. While you can’t incentivize reviews from customers, there’s nothing stopping you incentivizing your workforce to generate them. Landing Pages. Display a feed of reviews, create a dedicated reviews page or link out to profiles on third-party sites. Contact Pages. Add reviews and testimonials to key customer contact points. Schema Markup. Mark up ‘native’ reviews (rather than third-party reviews) with schema to bring star rating into SERPs. Twitter and Facebook. Pin and promote tweets containing your best reviews. Google Posts. Balance your more promotional posts with social proof like reviews and testimonials. Email Marketing. Include review site logos and star ratings to get better traction and a higher response rate with your emails. Display and Re-targeting Ads. Featuring review stars can build up trust before the consumer has even clicked the ad. Leaflets, Flyers and Business Cards. Your reputation doesn’t just have to live online. Bring it into the real world by including the fruits of your reputation management on your printed promotional materials. There are lots of good reasons to invest in reputation management software if you’re planning on taking your online reviews seriously. Automation saves you time and money, and removes the complexity of reputation management. *BrightLocal’s Reputation Manager allows you to do all this from $8 a month! I hope that I’ve demonstrated the importance of online reviews and shown that an effective reputation management strategy doesn’t have to stressful to implement. If you have any questions about our Reputation Manager tool, don’t hesitate to contact us. Thanks again to Eric Shanfelt and Riker Jones of the Local Marketing Institute for facilitating this great summit!